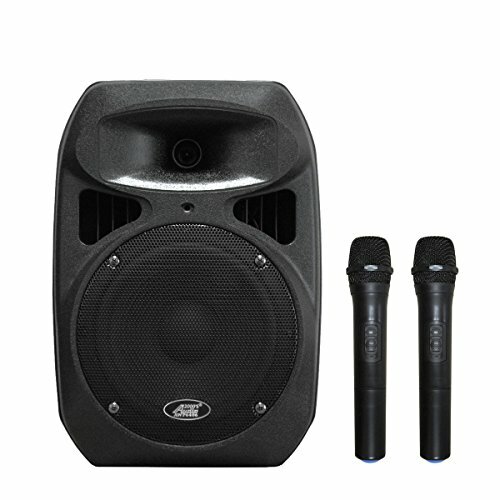 The Audio2000's AWP6408 portable all-in-one wireless PA system with a long-life rechargeable battery is a portable self-contained PA system built in with 8" woofer, 1" tweeter, wireless microphone system, amplifier and speaker. The above dual channel wireless microphone system includes two wireless transmitter which can be used simultaneously without any interference. The 3.5mm AUX input connector allows you to play the music by plugging in your CD player or an MP3 player including ipod while using the PA for speaking or singing. The combination of the built-in amplifier and the speaker of the AWP6408 provide 50W power output to achieve effective PA applications. This PA system can do charging & operating at the same time. The handheld transmitter is equipped with MUTE switch when slide the On/Off button to middle. Overall, the AWP6408 is designed and manufactured to be a versatile, user-friendly, convenient and reliable system has been widely used among such as teachers, auctioneers, studio instructors, sales promotion and etc. If you have any questions about this product by Audio 2000S, contact us by completing and submitting the form below. If you are looking for a specif part number, please include it with your message.